“Following group chat at work is like being in an all-day meeting with random participants and no agenda. It’s completely exhausting. I run a fully distributed team of engineers at Mailchimp, spanning three timezones, and we rely heavily on Slack. While we believe asynchronous work is a lot more powerful than real-time collaboration, we’re not quite ready to declare Slack a social-only tool. 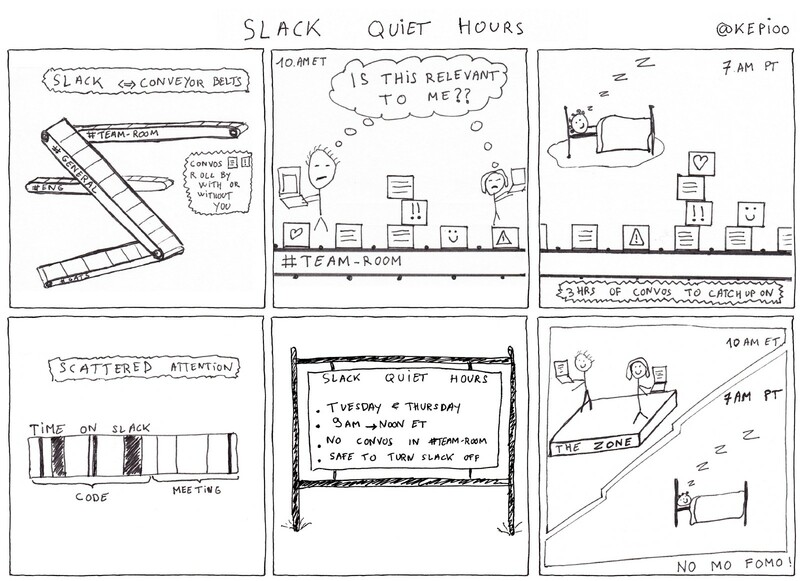 Recognizing that it’s hard to get into the zone and ship deep work while also keeping up with our team conveyor belt, we experimented with “Slack Quiet Hours”. Quiet Hours are periods of blocked-off time when the team should not chat in the #team-room. Setting an explicit expectation of no chatter creates a safe space where people know they won’t miss out any team-related discussions. Our team Quiet Hours are Tuesdays and Thursdays before noon Eastern Time. Why are we implementing Quiet Hours? The team recognized during a retrospective that they were unable to follow all of the conversations that were happening in our #team-room and were missing important discussions where decisions were made. The mental overhead of always having to keep an eye in our Slack channel impacted everyone’s ability to focus on deep work. For team members located in Oakland, their daily routine consisted of catching up with three hours of conversations that happened on the East Coast while they were asleep. Some conversations were relevant to their work and others involved decisions where they were not able to provide input. Team members are encouraged to save their questions and conversations for later or use JIRA / Github /emails. As the team lead, I keep an eye on the channel in case other people within the company need something urgently from the team. need something urgently from the team (in which case I can resort to other means of reaching out). How do we handle non-team Slack conversations ? This is left to the discretion of each member on the team — most people choose to apply Quiet Hours for all channels and set the clear expectations via their status that they are not available. What were the results of this experiment? All in all, this experiment (turned into a team practice) has been a unanimous success. Team members that were initially anxious about being blocked during quiet hours enjoy the quiet time and the ability to focus. Folks on the West coast were already used to quiet hours past 2pm Pacific time when all of their East Coast colleagues go home. They do appreciate not having to catch up on the morning conversations on Quiet Hours day. Finally, the experiment started to spread out internally with minor tweaks to each group’s designated day and time for Quiet Hours. Interested in trying this out with your team? Feel free to use the below one-pager to kick-off your own Quiet Hours experiment! Thanks to perri and Lurial. Engineering Manager at MailChimp, working remotely from Denver, CO.